My pool's plaster is in fairly poor shape. When we bought the house last year, I had never owned a pool before so it was a learning curve all the way through the season, with enormous help from the information I found here. Now it's time for phase 2... my plaster is pretty dirty looking so I thought "acid wash." I had a couple companies come out and they told me the same thing -- can't acid wash it because the plaster is shot. The conjecture is that either the pool was improperly acid washed in the past or it was drained and left empty for a long time in the AZ heat... but whatever the cause, the result is that the plaster is pretty much at the end of its life. I have a few larger cracks, but the current consensus is that they're cosmetic (not leaking). All around the perimeter where the walls transition to the floor is covered in spalling/spider web cracks. The plaster is pitted and the pores are retaining grime, making everything look dirty no matter how much I brush, etc. The surface is fairly rough to the touch. I'm investigating options for resurfacing. I'm trying to strike a bang-for-the-buck balance here. This is not a fancy pool or a million-dollar backyard... it's a hole in the ground with water in it. Pretty basic. I've had a few companies come out and everyone is pushing pebble surfaces, not surprisingly. Sure, they say, plaster is a little cheaper, but "new" plaster is not nearly as durable as "old" plaster due to new laws, etc. Most places are offering much better warranties on pebble and talking up the pros vs. plaster. I've gotten a few quotes ranging from "too good to be true" to "new Mercedes", with the middle ground being "used Honda." I just recently ran across aquaBRIGHT and immediately came here, I read through the threads and it looks promising. There is only one AB installer in Phoenix, which, I have to say... I find that very odd. Phoenix is a huge pool market. This makes me a bit cautious that more companies aren't getting involved with this product. I am going to have the one local AB installer come give me a quote. I'm hoping that my plaster is in good enough shape to be a good candidate for AB, but I really am scratching my head why this product isn't more prevalent here. AB reminds me a lot of Corian countertops. Is that a fair comparison? I am not a fan of Corian for counters, but as a pool surface I can see how it might be a good option. I know it's been covered, but if anyone has any thoughts on pebble vs. AB (since everyone has done everything in their power to talk me out of plaster) I'd be interested to hear them. I'll be curious to see how the quote comes out as well. In theory, I would think it would be a very competitive price to pebble/plaster, but at the same time there's only one installer here so there's no competition and it's a "niche" product which tends to drive prices up. AquaBright is indeed a very interesting surface, but it is no Corian...when you get the quote, you might want to hold your chin in your hand so it doesn't bang against the floor too hard. AquaBright will likely come in higher than the plaster quotes or basic pebble options. It's cost generally puts it into the "high end finish" category (similar to a PebbleFina or a high-end quartz plaster with embedded glass beads). The reason being is that, most of time, the applicator wants to chip out the old plaster and redo it. So you're paying for the replaster job AND the AquaBright coating which, in and of itself, is a labor-intensive process to get right (labor + materials costs are high with AB finishes). However, with that said, I'm very much looking forward to someday having an AquaBright pool because you really can't beat it's chemical performance. Unlike plaster which reacts with pool water and forces you to always be on top of saturation indices and CH concerns, AB is totally inert with respect to pool water. One of our fellow TFP'ers had his pool done with AB and his acid additions went from quarts per week to, well, I think he's still at zero acid added or maybe a couple of tablespoons. You really can't beat the AB performance in terms of chemistry. As long as the structural part holds up, there is no reason to believe that AB will fair any worse than plaster in terms of color retention and, in many cases, it performs better. Hmmm, interesting. I thought part of the appeal was that in all but the worst cases, it could be applied over existing plaster, saving that labor/material for replastering. If I'm paying for a chip out and replaster, then chances are good that I'll just stick with pebble. That was my thought exactly regarding the product until hearing about the reality of the installers and their willingness (or lack thereof) to accept the risk of a substandard base for installation. Hopefully yours will be the perfect mix of a plaster in adequate shape and an installer comfortable to go over it. But hey, a pebble finish is great too if you that route. Don't know if its an option for you, but I resurfaced wiht fiberglass, and am very happy with the decision. A while ago (maybe 10 years), my plaster was shot, coming up in large chunks, it was nasty. I got a few quotes, one for fiberglass. Fiberglass was a little more, but not a lot more than plaster. Fiberglass in inert, and very tough. Only downside is it was kind of slick when new, but after a little while that gets better. But all in all, 10 years later, I'm very happy that we choose fiberglass to resurface. As with all of this, it comes down to the guy doing the work. He did a lot of prep work, stripping out the old plaster to get a good surface to work with, before shooting the glass. Get some references and check them out. If they don't spend the effort up front, I don't think any solution would last. Hopefully yours will be the perfect mix of a plaster in adequate shape and an installer comfortable to go over it. That seems like the only way it would be a feasible option. I guess we'll see, I'll let you know after they come out to quote it. Hm, well I honestly don't know if anyone does fiberglass in Phoenix. Maybe it's a regional thing? I've never seen anyone advertise fiberglass surfaces and I don't know anyone that has had it either -- everyone around here either has plaster (if it's an older pool and hasn't been resurfaced) or pebble for anything more recent. I will ask, though... why not have another option for comparison? Part of the reason for the limited number of installers is that the manufacturer of the product likes for the installers have territories of about a 50 mile radius. The other half of the story is that it is a very expensive startup and a somewhat troubling application process, not to mention it's on the high end of pricing for pool finishes. 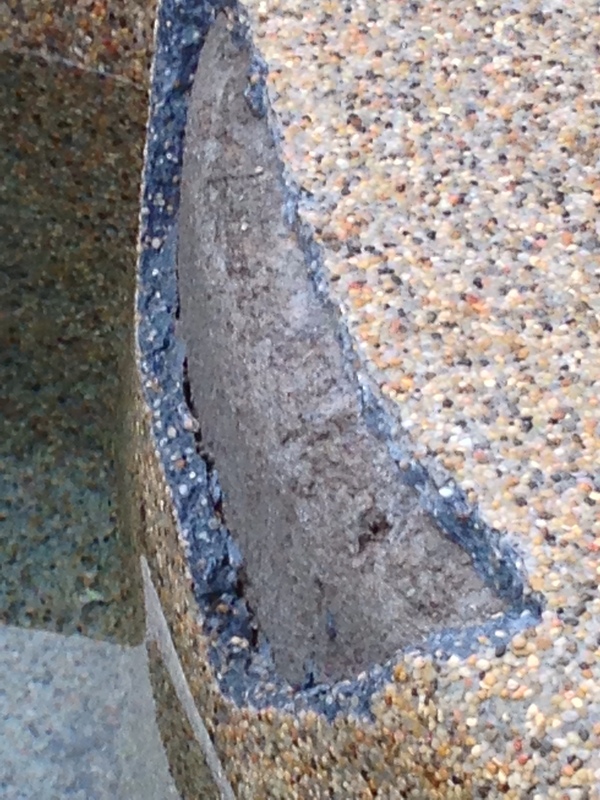 By the sounds of your description of your existing plaster it seems that coating your pool as is may not be an option. The extreme heat during installation is often detrimental to the weak areas aged plaster. I've even had sections of brand new plaster spall on me. Pebble finishes are very popular these days for good reason. They are typically very durable and have a pleasing appearance. Conversely, they can be very rough, prone to discolorations just as traditional plaster and are heavily reliant on the knowledge and workmanship of the applicator. Part of the reason for the limited number of installers is that the manufacturer of the product likes for the installers have territories of about a 50 mile radius. Wellllll, that whole air of exclusivity thing might come back to bite them, unless they're not ready for mass adoption of the product in the marketplace. If they want it to become mainstream they're going to have to get more than one company getting the word out and doing the work in a city with 6 million people, for example. Competition is good and as volume increases, the cost per install should decrease. Should be interesting to see what the contractor has to say. I don't disagree with you at all. I don't feel it's marketed all that well. So basic pebble was quoted at 5500, micro pebble at 6000, and aquabright at 7500. Those don't include tile or other associated costs which are consistent across the 3 quotes. The estimator did say that my pool was a good candidate for AB and it should go on over the plaster without an issue. While the AB is certainly interesting, I will most likely just go with pebble and use the extra 2k for new pad equipment. Take a good look at the pros and cons of each surface, warranties as well. While I am a good bit biased, I've found the AquaBright finish to be similar a SWG where you are paying the expense up front for added convenience (and in this case far less chemical usage). I don't doubt that the AB surface will at least make up the cost difference long-term from the pebble finish and potentially more. Do you know the perimeter footage of your pool? WOW! $7500 for AquaBright....I'd do that in a heartbeat. Given they usually come with a pretty impressive warranty, that's a steal. That was a bubble/crack/delamination in my Caribbean Blue standard PebbleTek coating. Notice something? Look at how faded that color is. You know how old that surface is? Less than 4 years old. Now, know this - I have only ever SLAM'ed my pool once and it was a very short SLAM. My chemistry has always been balanced and I have kept my pool water in impeccable shape since the very beginning. And that's the best plaster can do in term of color fastness .... that's sad. But that's exactly what you can expect out of plaster. Not to pile on to Brian's biases but I'd go AquaBright if they said $8,500....IN. A. HEARTBEAT. How about $8,500 + smoked meats ? I don't doubt that it's the superior option. They said it's a 10 year non-prorated warranty on the AB. Conversely, it's 10 years non-prorated + 5 years prorated on the pebble, as the pebble is their own product. As for the cost difference... it's theory vs. reality. Yes, eventually I would recover the cost offset due to reduced chemical needs, but even if I was spending $20 / month on muriatic acid (which I'm not...) it would take 100 months to make up $2000. I don't plan on living here nearly that long (I hope not, at least...). I realize it's not just the acid I was just making the example. I understand the benefits, but I'm weighing cost/benefit ratios and weighting it against time to return vs. anticipated time I live here. Also, the pool surface is only part of the overall expenditure... I still have to consider the cost of tile and getting the decking resurfaced. When looking at ~11k vs. ~13k, I need to try to spend wisely as I am not rich, and I have other large expenses looming for upkeep of the house this season. I believe it's 91 feet. BTW -- funny you mentioned the SWG because that's on my to-do list as well, though I will do that myself. I need a new pump, I can't believe mine is still running. I was going to replace the entire pad (literally, the pad is cracked too) with a new pump, cartridge filter, and SWG. However, more than one company has tried to talk me out of the SWG and into a UV system because "the salt will corrode my decking" and UV is better and cheaper, they claim. They're also telling me that regardless of how large a SWG I get, in the Phoenix summer it still won't be able to produce enough chlorine and I'd be adding chlorine anyway so I might as well use the UV system. I'm not buying it (the UV system OR their arguments against SWG). All valid points, for sure... and if the pool surface was the only thing I was faced with, I would probably spring for the upgrade. As it is, though, I need to spend quite a bit in other areas of this money pit so I just can't reconcile the extra money as a wise investment at this time. I do think I will ask if color fade/loss is covered by their warranty in some fashion, as they claim that their pebble warranty is far superior to competitors' as their pebble is their own in-house product. It can't hurt to ask. Do you believe the PB's that are trying to tell you about ozone and the SWG's effects on your deck and that it can't keep up in Phoenix? I understand your situation, you gotta keep some kind of budget. It's a nice surface and maybe the price will come down someday but not today. Oh, and just an aside - there's no such thing as ROI when it comes to pools. They are a luxury expense item (like buying a fancy car) and they will always be a depreciating quantity while adding only minimal value to a home. So as far as purchasing pool stuff, it's managing the losses not maximizing return. And you're absolutely right to be skeptical of the UV baloney....chlorine loss is easily minimized and managed even in the Arizona climate. The problems PBs experience with salt are all their own making by not installing properly sized systems, nor knowing how to properly diagnose them and poorly educating pool owners on how to maintain a pool (because most PBs don't know squat about water chemistry). Stick to an SWG and you'll be happy. Good luck on the renovation. In fact, that's the other thing keeping me from "splurging" -- as I know I'll never get the money back that I spend on the pool when I sell this house, I'm minimizing my losses and trying to maximize the bang for the bucks spent.